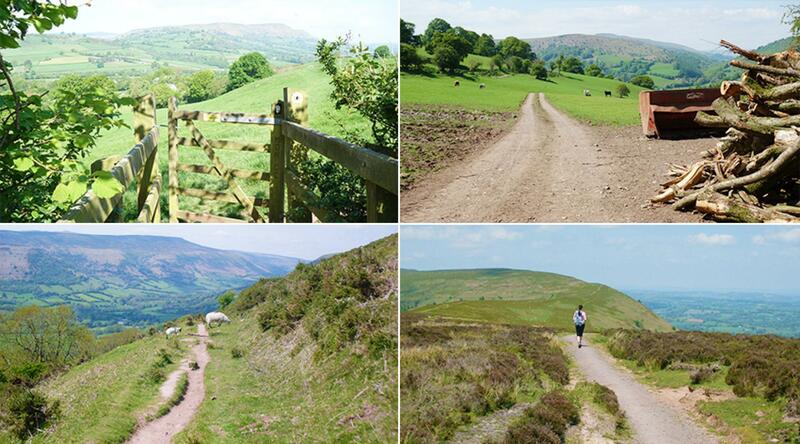 We grab just a snippet of Offa's Dyke Path in sunny mid-May. Hello, I’m Jude, and I've worked at Contours Holidays for just over three years. Myself and my husband Adam have just spent a weekend in Wales experiencing a small taster of life on the Offa’s Dyke Path. We arrived on Friday evening in the pretty village of Llangattock-Lingoed after a busy week at work. After a warm welcome from our host, we decamped to the local pub for a delicious meal, washed down by a couple of local ales before retiring to bed. We set off the next morning in bright sunshine following a fine ‘full Welsh’ breakfast. It was a perfect day for walking and really quite exceptional for mid-May. As we left the village, we had impressive views of Skirrid Mountain. We walked through some beautiful countryside, gradually ascending until we got to the big ascent of the day, up on to the Hatterall Ridge. It was quite a slog to get up there in the heat, but we were rewarded with spectacular views once we reached the Southern Trig Point. This seemed like a good time to crack open the packed lunch prepared for us by our host, as breakfast now seemed a fairly distant memory. It was tempting to linger, but we thought it best to get going again or we might never do. We proceeded along the ridge spotting several buzzards overhead, and then coming across several groups of wild ponies, looking somewhat weather beaten after the harsh winter. Eventually, Llantony Priory came into view in the distance on our left. Shortly after this point, we left Offa’s Dyke Path and turned on to the Beacons Way, which took us all the way down to LLanthony, a beautiful spot down in the valley. After a look around the Priory, we checked into our evening accommodation to have a refreshing shower and a siesta before dinner. Dinner was another hearty affair, again washed down with some fine local ales, whilst enjoying lively conversation with fellow walkers. The next morning, after a good night’s sleep and another very good ‘full Welsh’, we checked out heavy hearted. Another day walking would have been lovely, and we looked on enviously at the other walkers embarking on today’s walk in the sun. Alas, we had to get back home…and start the diet!